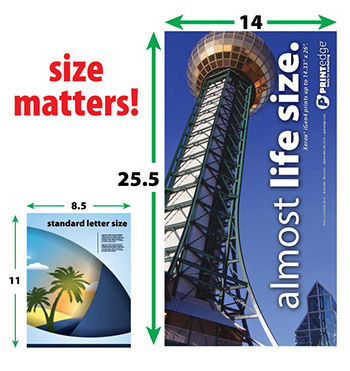 Printedge offers copying services that no one else in Knoxville can match. We keep a wide variety of stocks onsite and can easily order a custom stock from our fast, dependable vendors. You'll be amazed at the quality we have to offer! But if you really want to take it to the next level, add UV Coating to your copies to give them a shine that you have to see to believe. Need to make a BIG impact? Using our Xerox iGen4, we can give you a printable image area of up to 14"x25.5". You'll have to take a few steps back just to see all of your jaw-dropping poster!